Home is where the heart is, they say. At times, however, it can be where the stress is as well. Your home should be your sanctuary, a place away from it all — stress-free. With all the things we have to do just to keep our lives moving, our home and its functioning state sometimes get pushed to the bottom of the list. Life happens, and it’s going to continue to do so. Smart Organizing Solutions understands this. We’re here to help you free up that time and be able to have the stress-free environment you envision. Take a look at how our services can help you! Did you know that most people wear only 20% of their clothes 80% of the time? Think about what you have in your closet…still have your high school cheer-leading outfit or those comfortable parachute pants? 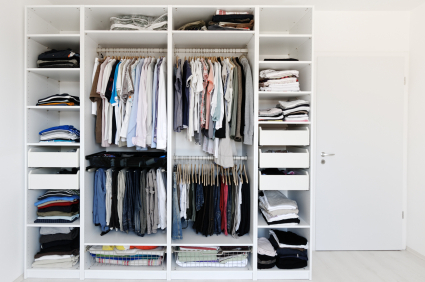 If this sounds familiar, then it’s a pretty good bet that it’s time to go through your closet. We can help you with those difficult decisions. Your son/daughter is on his/her way to college. Going to college is a time of change, so the easier the transition the better. This may be the first time they will be fully responsible for keeping track of their papers, schedules, and personal stuff. Why not send them off with organizing basics as well as great storage containers for dorm living? We can help with filing systems (paper and computer) and functional storage systems. Suddenly your home is quieter than usual and more spacious…or is it? This is a great time to determine what items are important to you, purge what isn’t, and possibly rearrange furnishings to suit your needs. The accumulation of material, unchecked, in an office results in a space that is cramped with visual clutter — you can’t find things, you’re out of storage space, and attempting to pay the bills just zaps your energy. We can provide solutions. Knowing what you have and being able to access it within minutes provides you with a feeling of satisfaction and control over your environment. Are you finding that your furniture doesn’t seem to fit or that you aren’t utilizing the space that you have? As we get comfortable with our surroundings, we often don’t see things that need to be changed. We can give you a fresh prospective, take inventory of what you have, and rearrange your current furnishings and accessories to your rooms’ best advantage. The average executive spends 108 minutes daily reading and sending email messages. We wear 20% of the clothing we own 80% of the time. The rest hangs there, just in case. Having had the opportunity to hire Cynthia and Smart Organizing Solutions on several occasions since 2002, her expertise is top of the line. In my first home, she took a job that I found insurmountable, organized, sorted, simplified, filed, and created a system that was easy for me to maintain. I found her skills very creative for a very limited space. Recently, she helped me move into my new, larger home. She packed me up and then unpacked everything, helped me pick out new furnishings that I loved, allowing me to simply walk over the threshold and begin living there. We have tolerated two ‘unlivable’ rooms due to poor furniture placement for 9 years. Cynthia changed them into great, comfortable spaces for conversation and enjoyment in less than an hour. Despite the initial statement that she was ‘stumped,’ she brought just the right touch of ingenuity and functionality into the rearrangements. We are truly grateful to Smart Organizing Solutions and have announced it to over 40 friends and associates.